Friday’s earthquake may become known as Sendai quake. Sea level disturbances continue. The magnitude 8.9 earthquake which struck off the coast on Honshu on Friday 11th may become known as the Sendai quake, being named after the large city which was close to the offshore quake. As expected, sea level disturbances are continuing around New Zealand coasts as a result of the tsunami generated by the massive earthquake. Marine warnings have now been cancelled, but small surges are still occurring. 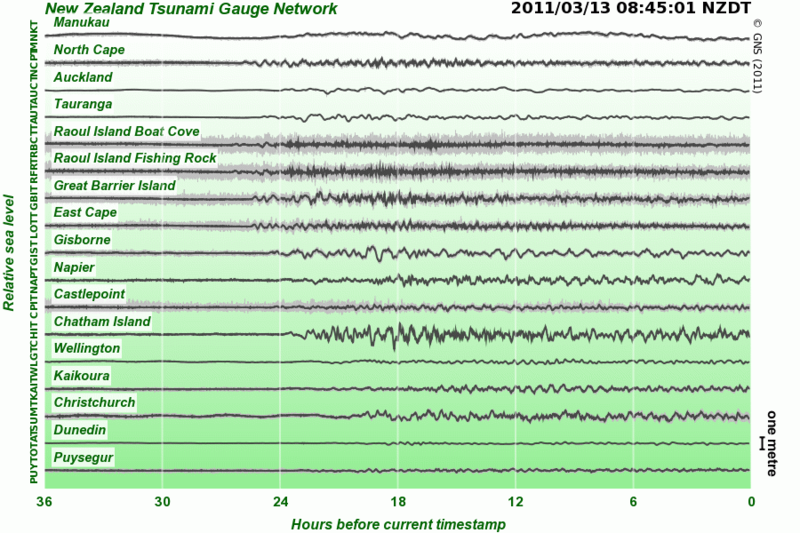 [click to enlarge image] GeoNet’s tsunami gauges show the sea level fluctuations that are still occurring more than a day after the first tsunami arrived at our coasts. The United States’ National Oceanic and Atmospheric Administration (NOAA) has prepared an animation which shows the Sendai tsunami radiating away from Japan and across the Pacific. This is a model, but of particular interest is the wave being reflected back into the Pacific from the coast of North America, and the way that the waves flow either side of New Zealand and seem to wrap around our coast. Dial-up users may find that the animation takes about 10 minutes to download, so make a cuppa. NOAA’s Sendai tsunami animation can be found here. This entry was posted on Sunday, March 13th, 2011 at 2:27 pm and is filed under Earthquakes - Observations. You can follow any responses to this entry through the RSS 2.0 feed. You can skip to the end and leave a response. Pinging is currently not allowed.